Iran has missiles with a range of 2,000 km, a former president and one of the country's most influential politicians has said. Hashemi Rafsanjani's comments came in a speech a research institute in Tehran, and were reported by the Iranian news agency. 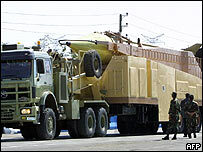 Correspondents say this is a substantial addition to the previously announced range of Iranian missiles. It would bring Israel easily within range of Iran's ballistic missiles. Iran maintains that it would only use its missiles in self-defence. 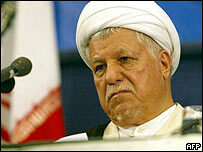 Mr Rafsanjani said Iranian experts could now achieve "all subsequent stages" in the missile production process. In August, Iran was reported to have test-fired a new version of its Shahab-3 missile. The old version was known to have a range of 1,296km (about 800 miles). Mr Rafsanjani remains among the most influential conservative politicians in Iran, and is believed to have been the architect of Iran's nuclear programmes. President for two terms from 1989-97, he is currently chairman of the powerful Expediency Council, as well as a deputy chairman of the Assembly of Experts. Though he was, in Iranian terms, pro-Western as a president, Mr Rafsanjani has been more closely associated with the conservative or hardline camp in recent years. Mr Rafsanjani's assertion comes at a time of increased tension regarding Iran's nuclear programme. The Israelis say they are concerned, not simply about signs of Iran's growing military potential, but about Iran's belligerent manner. The chief of Israeli military intelligence says Iran could be six months from being able to produce a nuclear weapon. But Iran insists it has only peaceful nuclear intentions. The BBC's David Bamford says its statements about missile capabilities are being seen as a response to speculation that Israel might take direct action if the Iranians get close to acquiring nuclear capabilities of any sort.